With their usually spiny leaves arranged in neat rosettes, and tall candle-like inflorescences in predominantly red and vibrant orange hues, aloes are increasingly sought after by gardeners and horticulturists, as they brighten up the dull winter landscape. Aloes come in a variety of growth forms, from small miniatures to tall single-stemmed or branched trees, while certain species even form large, tangled shrubs. The usually swollen and succulent leaves are more or less lance- or sword-shaped in outline and boat-shaped in cross-section. Leaves are arranged in terminal clusters (rosettes) and are armed along their margins with usually sharp, but sometimes soft, teeth. Flowers are grouped in candle-like or cone-shaped inflorescences, which can be branched or simple. The most common shape of flowers found in Aloe is tubular flowers, although some species have curved or even bell-shaped flowers. Flowers are typically brightly coloured and most often in various hues of red, orange and yellow, but there are also some species with green, pink or white flowers. The vast majority of aloes flower in winter, while some groups, like the grass aloes for instance, usually flower in spring or summer. Aloe fruit are capsules that dry out and split open to release the mature small, brown to black, angled seeds that sometimes have a narrow or prominent translucent or white wing. The wing is thought to aid wind dispersal of the seeds. There are a group of ± 20 aloes from Madagascar and the Mascarene islands that have a fleshy berry, which does not dry out completely and become woody. These berried aloes are sometimes separated into the genus Lomatophyllum Willd. and their leaves are generally not as succulent as those of other aloes. Aloes are mostly long-lived plants, especially the larger species. A specific quiver tree (Aloidendron dichotomum) was estimated to be between 100-145 years old, while some exceptionally tall specimens (of over 10 m) of Aloe marlothii may even be over 200 years old. All species of Aloe (except for A. vera L.) appear on CITES (Convention on the International Trade in Endangered Species of Wild Fauna and Flora) Appendices, meaning that trade in aloes is controlled to prevent utilisation that would be incompatible with their survival. A total of 21 species, including varieties of some of these species, are included in Appendix I and trade in specimens of these species is permitted only in exceptional circumstances. The other aloes are all on Appendix II and therefore certain permits are required to trade in these aloes. In South Africa most aloes are also protected, with very few exceptions, by environmental legislation in all nine provinces. It is thus illegal to remove plants from their natural habitat without the necessary collecting and transport permits issued by a provincial or other nature conservation authority, and consent from the land owner. In the latest Red List of South African Plants, a total of 46 aloes are listed as species of conservation concern: Critically Endangered: 5; Endangered: 4; Vulnerable: 15; Near-threatened: 10; Rare: 9; Declining: 1; Data Deficient –Insignificantly known: 2. Common threats listed for the survival of these aloes are restricted distribution ranges, habitat destruction and fragmentation, collecting for horticultural purposes, invasive alien encroachment, and harvesting for medicinal purposes. Aloes are prominent components of many, mainly arid, African landscapes. There are currently ±600 different aloes recognised. Members of the genus can be found in Africa (±405), the Arabian Peninsula (±45), Socotra (4), Madagascar (±145) and the Mascarene and other Western Indian Ocean Islands (±7). On the African continent aloes occur over much of Sub-Saharan Africa, although they are mainly concentrated in the southern and eastern regions of the continent; only two or three aloes are found in western Africa. 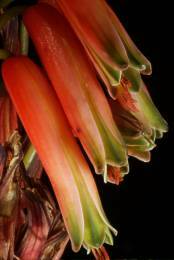 High centres of aloe diversity are found in South Africa (±155), Madagascar (±145), Tropical East Africa (i.e. Kenya, Tanzania and Uganda; ±85), the Horn of Africa region (i.e. Ethiopia, Eritrea and Somalia; ±76) and the Arabian Peninsula (±45). In South Africa the ±155 species of aloe can be found in almost all vegetation types, from the arid to semi-arid regions of the Karoo, the winter rainfall fynbos region, succulent thickets, grassland and savanna, and even in comparatively high-rainfall forests. Most aloes have small or fairly limited distribution ranges, and are often associated with only one of these vegetation regions, but a few are widespread, like Aloe arborescens and Aloe maculata. The origin of the genus name Aloe is uncertain, but the most popularly accepted suggestions are that it is derived from: the Arabic alloch or alloeh, a vernacular name for medicinally used members of the genus; or the Greek aloë, referring to the dried juice of aloe leaves. Aloes are well-adapted to the often arid conditions found in their natural environment. Their succulent leaves enable them to survive prolonged periods of drought. Sharp thorns and spines, as well as usually bitter leaf sap, are good deterrents for many herbivores, although certain animals seem completely undaunted by these defence mechanisms of aloes and the juicy leaves are often eaten. Aloes often occur in environments that are prone to regular fires. Several strategies exist through which plants survive these fires. Some aloes are resprouters; fires can completely kill the above-ground parts, but plants have a thick underground rootstock that resprouts. Other aloes survive fires by growing in fire protected habitats; these are most often rocky outcrops, where the fire is not as severe as in the surrounding grassland vegetation. Many stemmed aloes retain their old dry leaves around their stem and this acts as an insulator against the heat of fires. Brightly coloured, tubular flowers that are filled with nectar are a welcome source of food during the winter. Aloe flowers are regularly visited by pollinating birds and insects, but also by pollen and nectar thieves (these can be insects, birds or mammals) that do little in terms of pollination; some can even destroy an inflorescence completely. Economic and cultural value Aloes have a very long history of medicinal, cosmetic and cultural uses. Many early civilizations were familiar with the healing properties of Aloe vera in particular. This species likely originates from the Arabian Peninsula, but is today cultivated almost world-wide and has become naturalised in many areas. Over the past decades the use of Aloe ferox, indigenous to South Africa, in the traditional pharmaceutical and cosmetic industry has increased significantly. Parts of the leaf, but especially the leaf sap and the leaf pulp or gel, is variously used as a laxative, vermifuge, or to treat arthritis, conjunctivitis and sinusitis. It displays antioxidant, anti-inflammatory and antiseptic properties and is recently also claimed to have antiviral properties.This makes it a very commonly used remedy for skin irritations, cuts, abrasions, minor burns, sunburn and bruises. Aloe sap (or bitters) or gel are included in health tonics, nutritional supplements, cosmetics and skin-care products such as shampoos, soaps and moisturising lotions. Aloes also have various culinary uses in the form of marmalade, jams, pickles and preserves. Some aloes are part of cultural superstitions, i.e. Aloe variegata (kanniedood) is planted on graves to ensure eternal life. In rural areas aloes are often used as live animal enclosures or as natural hedges and boundary fences. They have even been employed on road cuttings, etc. to stabilise the soil and prevent soil erosion. Aloes are very popular and some of the most rewarding plants to cultivate. They make excellent accent plants owing to their often strange and inspiring architectures, as well as the bright flowers that offset the grey-green leaves. They are also very suitable as container plants and small aloes can be used very effectively as border plants at the edge of a bed. Although aloes are most often included in rockeries, their application in horticulture is not limited to this feature and they can be used in almost any setting and in conjunction with most common garden plants. 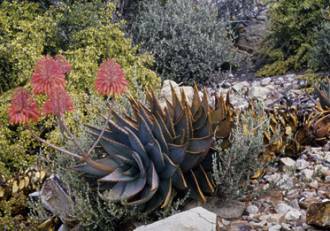 Their natural adaptation to harsh and often arid climates, makes aloes superb subjects for the water-wise garden. Aloes can tolerate long periods of drought, but it is not true that watering should be withheld to obtain optimal growth. Stressed plants are more susceptible to insects and pests. Plants thrive, flower better and are more resistant when given adequate water during the growing season. However, be very careful not to overwater aloes as this can cause them to rot, especially when the soil does not drain well. Although there are some species that are very difficult or even impossible to grow successfully, the vast majority of the more common aloes are easy and can readily be grown almost anywhere in the country. Aloes generally require soils with good drainage and do best in warm climates. When planted in rich soil that are regularly mulched plants will do well for many years without intervention and are thus require very low maintenance once established. Extra protection may be necessary in cold areas as very few aloes can withstand severe frost. To ensure success it is necessary to know the conditions under which a species grow in their natural habitat and to choose aloes that will naturally do well in the particular area and local climate where you live. Seed: Propagating aloes from seed is relatively easy and germination usually starts within one week of sowing. Seed should be harvested as soon as the capsules are dry and start to split open. A resting period is not required and seed should be sown fresh if possible. In South Africa the best months to sow seed is from August to February. Use a mixture containing equal parts of sifted compost and coarse river sand, sow seed over the surface and cover with a very thin layer of soil or pure sand, followed by a layer of pea-sized gravel. The gravel layer provides support for the emerging seedlings which have a very weak root system and are very tender during their first few months. In nature seedlings are usually found in the shelter and shade of Ã¢e~nurse' or companion plants. Try to imitate this by keeping the seedling trays in the shade. Seedlings can be transplanted once three true leaves have formed, usually after about a year. Cuttings: Cuttings are a popular and reliable way of propagating tree and shrub-like aloes. Stem cutting should be allowed to dry in the shade for a few days or even weeks, and then planted in the intended spot in the garden. Leaving cuttings to dry before replanting allows for the wound to heal and dry. This much reduces the risk of fungal infection and eventual rotting of the entire cutting. Plants grown from cuttings will reach maturity faster than plants grown from seed. Division: Suckering aloes that form large clumps of many rosettes can be propagated by splitting a clump into individual plants. Suckers and small plants should be removed from the mother plant with a sharp knife. These should also preferably be left to dry in the shade before planting, especially if the suckers do not yet have roots of their own. Plants that already have roots can be planted into their required places or pots, and will become established faster than rootless plantlets. As in the case of cuttings, plants grown from clump division will reach maturity faster than plants grown from seed. The krantz aloe is a multi-stemmed, much-branched shrub up to 3 m high (or sometimes even 5 m), with leaves in dense rosettes at the branch tips. Leaves are greyish green with yellow teeth. Inflorescences are usually simple with elongated-inverted conical, densely flowered racemes. It usually grows in pockets of rich soil on rocky outcrops in mountains in areas of high summer rainfall, but can also be found right up to the coast. The krantz aloe is very widely distributed in southeastern Africa from the Cape Peninsula, along the south and east coast of South Africa, as well as further north to Mozambique and the eastern mountains of Zimbabwe and Malawi. Cooper's grass aloe is characterised by its distichous (2-ranked) leaves that are ridged (keeled or V-shaped) on the lower leaf surface and the inflorescence, which can sometimes be shorter than the leaves, with salmon-pink, green-tipped flowers of 25–40 mm long. It regularly occurs in marshy places, but also grows in well-drained areas, often among rocks on hillsides. This grass aloe occurs mainly in KwaZulu-Natal, Swaziland and Mpumalanga, just entering the eastern Free State and Lesotho. The quiver tree with its very distinctive growth form is a much-branched tree aloe with a thick trunk with peeling bark and a rounded crown. Flowers are bright yellow and borne in short, erect, few-branched inflorescences. It grows in arid, rocky hillsides in the western and northwestern regions receiving minimal rainfall. The quiver tree occurs from the Brandberg in Namibia southwards to Nieuwoudtville, and eastwards to Upington and Kenhardt in South Africa. The bitter aloe has an erect, unbranched stem of up to 3 m high, with persistent dried leaves and erect, much-branched, candelabra-like inflorescences with up to eight symmetrical racemes of bright red or orange flowers. It grows on rocky hillsides, on the margins of the karoo, as well as grassy fynbos, Little Karoo and grasslands, where winters may be severe to mild. It is widespread through most of the Eastern Cape and extends into the southeastern Free State, southern Lesotho and the Western Cape to the Swellendam area. The bitter aloe is frequently harvested for use in the medicinal and cosmetics industries. The common soap aloe is characterised by its spotted, broadly triangular leaves and flat-topped, head-shaped (capitate) racemes reaching 10–12 cm in length and 12–16 cm in diameter with pink or orange, sometime yellow or red, flowers of 35–45 mm in length. 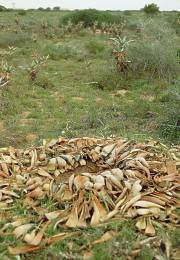 It grows in a variety of habitats, including grassland, thicket and rocky outcrops, and is one of the most widely distributed of the spotted or maculate aloes. It occurs from the Cape Peninsula through the Western and Eastern Cape, into the eastern Free State and Lesotho, through KwaZulu-Natal to Mpumalanga and Swaziland. The Karoo aloe or Worcester aloe has copiously white-spotted leaves and simple inflorescences of 0.6–0.8 m high, with typically bicoloured racemes. Floral buds are usually a dull red and open flowers greenish yellow and 25–30 mm long. This speckled aloe grows in rocky outcrops in Karoo, desert, semi desert and Namaqua Broken Veld. It has a disjunct distribution, occurring fairly widespread in the western parts of the Eastern Cape, the central areas of the Western Cape and into the Northern Cape, as well as in southwestern Namibia. The mitre aloe has long, creeping stems with only the terminal apical rosettes erect. Leaves are slightly incurved with variably coloured marginal teeth. The dull to bright red flowers are carried in characteristically rounded or head-shaped (capitate) racemes. This creeping aloe grows in sand and clay and prefers rocky areas, even growing on vertical cliffs. It occurs from the Bokkeveld Mountains near Nieuwoudtville in the Northern Cape, southward to Genadendal in the Western Cape. The coral aloe is an acaulescent plant, usually with solitary rosettes. Its leaves are sea-green and characteristically striated with narrow, entire (without teeth), pink margins. Inflorescences are much-branched, flat-topped panicles with peach-red to coral-red flowers. It grows in a variety of habitats and is widely distributed from east London through the central and western parts of the Eastern Cape to near De Doorns in the Western Cape. This rambling aloe forms a small untidy shrub consisting of a tangled mass of thin, branched stems. Leaves are blue-green with a prominent sheath that is not auriculate, and obscurely lined. The small red, orange or yellow flowers are cylindric and uncurved, and carried in elongated racemes. This aloe grows in open country on sandy soil and rarely in valley bushveld. 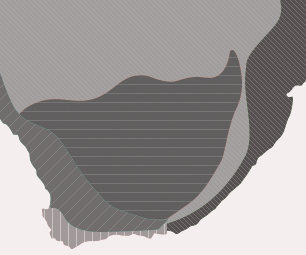 It occurs from fairly widely in the Eastern Cape and into southern KwaZulu-Natal, with a disjunct distribution in northern KwaZulu-Natal at the border with Swaziland and Mpumalanga. It is very popular in horticulture. The partridge-breast aloe is a dwarf aloe that is easily distinguished by its distinctly mottled, dark green to almost black-green, 3-ranked leaves with a creamy white, bony, spineless margins. It grows in clayey soils or rarely soils of decomposed granite, in Karoo vegetation and on the edge of the Namib Desert, usually in the protection of small bushes. It is very widespread, occurring from southern Namibia, through the Northern Cape, eastern parts of the Western Cape and western parts of the Eastern Cape, and just entering the western Free State. Bornman, H. & Hardy, D.S. 1972. Aloes of the South African veld. Voortrekkerpers, Johannesburg. Craib, C. 2005. Grass aloes in the South African veld. Umdaus Press, Hatfield. Jeppe, B. 1969. South African aloes. Purnell, Cape Town. Raimondo, D., Von Staden, L., Foden, W., Victor, J.E., Helme, N.A., Turner, R.C., Kamundi, D.A. & Manyama, P.A. (eds). 2009. Red List of South African Plants 2009. Strelitzia 25. South African National Biodiversity Institute, Pretoria. Reynolds, G.W. 1950. The aloes of South Africa. The Aloes Book Fund, Mbabane, Swaziland. Smith, G.F. 2003. First field guide to the aloes of South Africa. Struik, Cape Town. Smith, G.F. & Van Wyk, B. 2008. Aloes in southern Africa. Struik, Cape Town. Van Wyk, B-E. & Smith, G.F. 1996. Guide to the aloes of South Africa. Briza, Pretoria.